I am drawn to stories that expand and deepen my knowledge about urban wildlife. CITY CREATURES edited by Gavin Van Horn and Dave Aftandilian does this well. The hefty edition of essays, poetry, paintings, and photographs illuminate the range of animals living in cities and our multiple relationships with them. I am happy to present a book review. Gavin Van Horn and Dave Aftandilian are natural fits for a book of this ilk. Van Horn is director of Cultures of Conservation for the Center for Humans and Nature and is writer and editor of the center's blog, City Creatures. He's the co-editor (with John Hausdoerffer) of Wildness: Relations of People and Place (2017) and the forthcoming The Channel Coyotes: Otherworlds of the Urban Wild. Aftandilian is associate professor of anthropology and director of the Human-Animal Relationships (HARE) minor at Texas Christian University. He's the editor of What Are Animals to Us? Approaches from Science, Religion, Folklore, Literature, and Art. The subtitle of CITY CREATURES is "Animal Encounters in the Chicago Wilderness." The latter part of the subtitle refers to the Chicago Wilderness coalition formed in 1996 to do regional-scale conservation and restoration work. The perhaps purposeful use of the word "wilderness" forces one to discard notions of the city as a place antithetical to wilderness. With this book, Van Horn and Aftilidian argue that the city-region is "a hot spot for biodiversity," not a "biological desert." The animals that are storied in this book are not all traditionally wilderness species nor are typically wild creatures found in their natural habitats. The first story of the book is about chickens which seems the most domestic of animals without being a pet. But essential to CITY CREATURES is all the ways in which humans and non-human animals are in relation with each other. Other stories in the 'Backyard Diversity' section deal with squirrel, opossum, raccoon, hawk, scarab, and wasp. The next section, 'Neighborhood Associations', also features animals of daily encounters though the spaces we tend to encounter them are a bit beyond our domestic/home realm. Still squirrel but also coyote, bee, cricket, pigeon, feral cat. The third section, 'Animals on Display," is a striking shift from the creatures considered in the first two section. The spaces of animal encounters are zoos, aquariums, and museums. The animals are live and dead. I have an uneasy relationship with zoos and aquariums. I visit them and have taken my children to them, but I'm never sure if I should. Museums on the other seem more comfortable territory, though the provenance of the collections aren't without their controversies. I particularly enjoyed the stories about museum specimen collections because I am learning to prepare museum quality bird study skins for a teaching collection. Rebecca Beachy's "A Living Taxidermy" documents the process of creating a study skin from a salvaged Ringneck Pheasant. The preceding story, "Nature on Pause" by Peggy Macnamara, is illustrated with the author's beautiful paintings of bird mounts, study skins, nests and eggs as well as pinned butterflies and frogs preserved in jars housed at the Field Museum. The fourth section represents another dramatic transition. The stories shift from corralled spaces to the more open spaces of parks, forests, and "natural areas." Soil as an expansive space is also featured in photographs of Sharon Bladholm's casts of insects. Andrew S. Yang's "Letting the City Bug You" is a phenomenal exploration of collecting insects, as an adult, in the city. An interest in insects seems like an odd mix of the quaint, the trivial, the gross, and certainly the uncultured....to pay attention to insects seems like the symptom of an unfettered curiosity that is acceptable in a kid but seems awkwardly deviant in an adult. And yet as singular or even unsocial as seeking insects might seem at first, I have found that its public nature can lead to unexpected connection. Mobile and spontaneous, new social spaces have opened in surprising ways....Passersby look twice,smilesquint, and just as often stop and ask what we were doing. They want to look at what we are looking at, and consequently they see something they wouldn't otherwise find. Many of the urban natural history books I've read focus on terrestrial animals, often vertebrates. CITY CREATURES gives significant page time to non-vertebrates and to aquatic animals. The habitat types in 'Water World's range from lake to river, from creek to pond. Possibly my favorite story in this fifth section of the book is "Canoeing through History: Wild Encounters on Bubbly Creek" by Michael A. Bryson, though many more birds than fish are mentioned in the story. I like this story for a few reasons. I enjoy visual elements in stories and the author's map drawing of the creek and its environs is a figure in the story. The map is annotated with significant places mentioned in the story. "Canoeing through History" is smoothly narrated with detailed information about what the participants saw in the water and along the creek's banks. The author narrates in the first person but he also uses the collective "we" which I found engaging. Finally, I appreciated the author's consideration of the socio-politcal dynamics that affect nature appreciation and access. Van Horn and Aftandilian describe the sixth section of the book as coming "full circle" because the stories consider two sets of animals: (1) ones that inhabited the landscape before urbanization, were locally extirpated, and have been reintroduced (bison) or are reclaiming territory (coyote) and (2) ones that have become naturalized (monk parakeet) or are feral populations of formally kept species (pigeons). Dave Aftandilian's story and illustration of an inhabited monk parakeets' nest is not to be missed. This section, and the book, ends with a painting titled Indiana Dunes by African American painter, Blake Lenoir. You can find images of some of Lenoir's paintings here. The verdancy and faunal diversity, with a deep blue thread of water, depicted in the painting speaks a thousand words about the pre-colonial landscape of Illinois. "Keeping Chickens" by Terra Brockman followed by Colleen Plumb's photograph "Holding Backyard Chicken" and a photograph of Alma Dominguez's exhibit "Consumes mi dolor...mi merge/You consume my pain...my death" which features chickens. Between "Canoeing through History" by Michael A. Bryson and "Calumet" by John Rogner is a poem titled "The Fish in the Cage" by Todd Davis sandwiched on each side by two artworks: Riverwalk Gateway, the South Branch of the River and Riverwalk Gateway by Ellen Lanyon as well as Pond Reflection and Flood by Eleanor Spiess-Ferris. I wish I could collect many of the artwork in the book as postcards or as small canvases to hang in my apartment. The list of favorites is too long to list here. One of the more inspiring ones is Diana Sudyka's illustration titled Birds Spotted While Hiking Wooded Isle, Hyde Park, Illinois. You can view the Hyde Park bird print here. 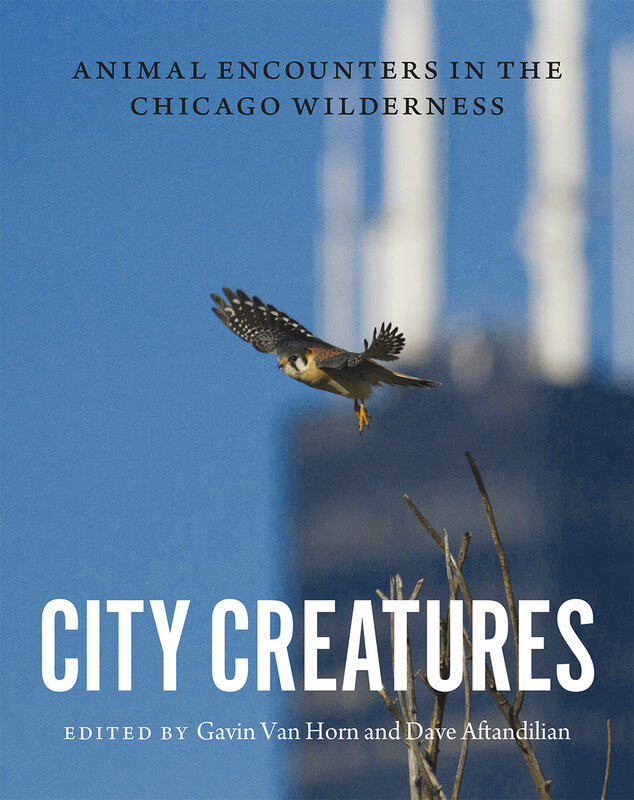 Although CITY CREATURES is clearly grounded in the Chicago region, the overarching themes of the city as ecologically rich and dynamic space and the multiplicity of relationships between humans and non-human animals are relevant in many, certainly North American, cities. I especially appreciate that the book does not present a dismal ecological outcome. While it does point out the damaging impact that humans have had and continue to have on ecosystems, the first-person narratives in the book clearly illustrate not only the fostering role of humans but also the agency of wild animals in reclaiming and staking out territories in cities. A complimentary copy of CITY CREATURES was provided by Gavin Van Horn.